There have been so many awesome little pumpkins and gourds at the farmer's markets this year and I wanted to snag a few and make my own easy, adorable fall decor. Since I don't really have the room to carve pumpkins (and quite frankly don't want to deal with the mess quite yet), I decided to give these little dudes a makeover — a la the future. Think: robots. metallic. glitter. minimalism. holograms. outer space. Follow the how-to after the jump. Pumpkins, white acrylic paint, a small brush, metallic Paint, and Glitter paint. A clear coat is optional. First I gave the stems a coat of white paint. I used a slightly off-white color. Make sure the coat isn't sheer and the stem is covered well. This will give you a good base for the metallic color. After the white paint was dry, I gave each pumpkin two coats of silver metallic paint. This Martha Stewart Specialty Finish paint is the metallic paint I've found in a long time. I bought it to repaint my kitchen hardware (my landlord painted over all of the amazing vintage details with, gasp, icky white!) and had some leftover for this project. Even though I'm making the smaller pumpkin holographic, I used the silver as a matching base coat. Once the silver was dry, I gave the stem a nice clear coat. On the smaller pumpkin, I gave it three coats of the holographic glitter paint to make a great silver sparkle. I also gave this one a clear coat once it dried. And wha-la! 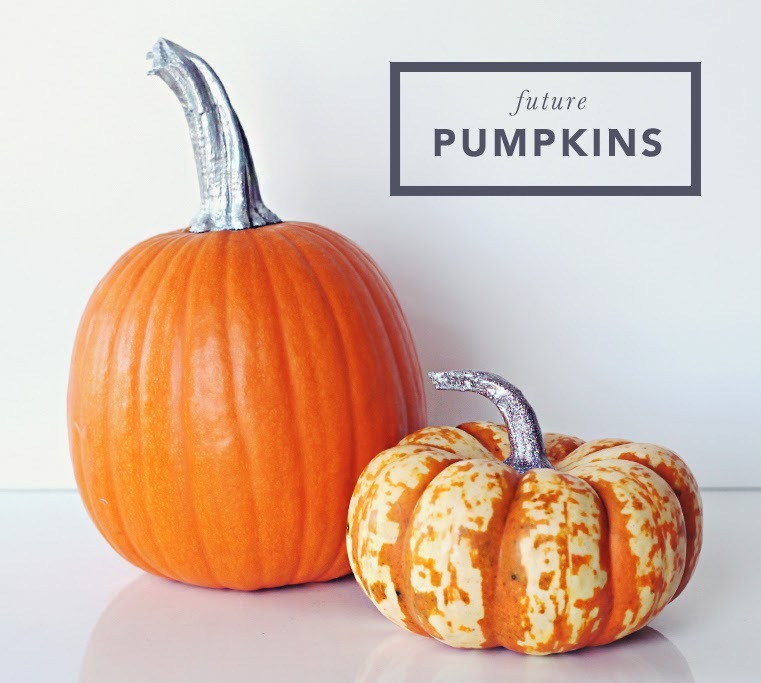 In around 30 minutes, you can gave some adorable future pumpkins! Try different metallics, glitters, and golds for your own twist!